Samson Ratshilumela Mudzunga was born in 1934 in the Nzhelele district of the former Venda ‘homeland’, now Limpopo province. However, Apartheid-era documents noted his year of birth as 1938, a date still recognised as correct in many publications. He began experimenting with moulding clay as a child, and at around age fifteen began to teach himself how to carve. He sold his pieces to supplement his family’s income, but did not make art his primary career until later in life. After completing Standard Five, Mudzunga moved to Johannesburg and found a job as a gardener. At the time, when he was around age 18, he took a break from carving that would last several decades as he worked multiple other jobs. Mudzunga was in his eighth year of working as a driver in Johannesburg for the packaging company called Kohler when he had a premonition he would lose his job. He decided to pursue art again, after more than three decades. 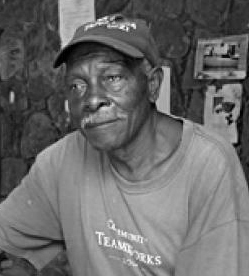 While occasionally selling pieces on the street, he built up a collection of carvings substantial enough to mount an exhibition at the gallery of the Federated Union of Black Artists (FUBA) in 1988. Artist David Koloane curated the show. Soon after, Mudzunga held another exhibition at the Zona Gallery in Norwood. After Mudzunga’s bosses came to view the show at the Zona Gallery they accused him of earning two salaries and misusing company time, and decided to dismiss him in May 1989. This signaled a turning point in Mudzunga’s career as an artist. Confrontation and controversy marked his shows beginning with the Zona Gallery. The press statement for this exhibition described Mudzunga’s loss of his job ‘for the love of his art’ and need to support himself and his family, including eight children, through his art, which some called a ploy to help with sales and publicity. Mudzunga’s works have included instruments and tools which reference elements of traditional Venda culture. An interest in myths and rituals infuses much of Mudzunga’s work, along with challenges to the politics of power relations in his community. In 1997 Mudzunga was imprisoned on charges of arson and property damage. He continued carving while in jail, during which time his mother died at age 110. Her burial near Mudzunga’s brother’s house rather than his own created conflict in the family, exacerbated by the his son’s decision to sell two of Mudzunga’s drums for less than what the artist estimated they were worth. In 2014 Mudzunga was involved in a controversy over payment for his work. He accused his lawyer and manager Alan Jacobs of withholding payment for several international performances, and gallery owner Michael Stevenson of selling drums without Mudzunga’s consent. Both men denied the artist’s charges. Mudzunga’s exhibitions include a 2000 group show at the Natal Society of the Arts (NSA) Gallery, where he helped run a workshop for students from the Technikon Natal and the African Art Centre. Since 1996, his shows have involved performance as well as the exhibition of his carvings and drums. He performed at his solo show at the Jack Shainman Gallery in New York in 2006, and at his exhibition at the Contemporary Museum in Honolulu, Hawaii. The latter experience inspired his piece ‘Fundudzi in Honolulu Hawaii’, a drum evocative of a shark which the cultural documentary series Headwrap later featured. In 2004 Samson was included in the book 10 Years 100 Artists: Art in a Democratic South Africa. • Coates, K. and Hobbs, S. (2001) Samson Mudzunga: Artist’s Book, TaXi monograph by David Krut Publishing, Johannesburg. • Mudzunga, S. (2003) ‘Suka Dzivha Fundudzi’, Johannesburg Art Gallery, Johannesburg.